Today has been one of those golden Autumn Sundays, with long shadows and dreamy sheep in the meadows, and secret warbles emanating from the hedgerows. Hoping to garner enthusiasm for my university assignment due tomorrow, I took a stroll up the lane to visit the wildlife pond. Although the fields are flooded, the pondwater was very low today, exposing its weed-covered silt. Somewhere under the surface the fish were no doubt lurking, but the water looked lifeless – except for a large grey heron standing knee-deep in it, stabbing among the weeds with its beak. 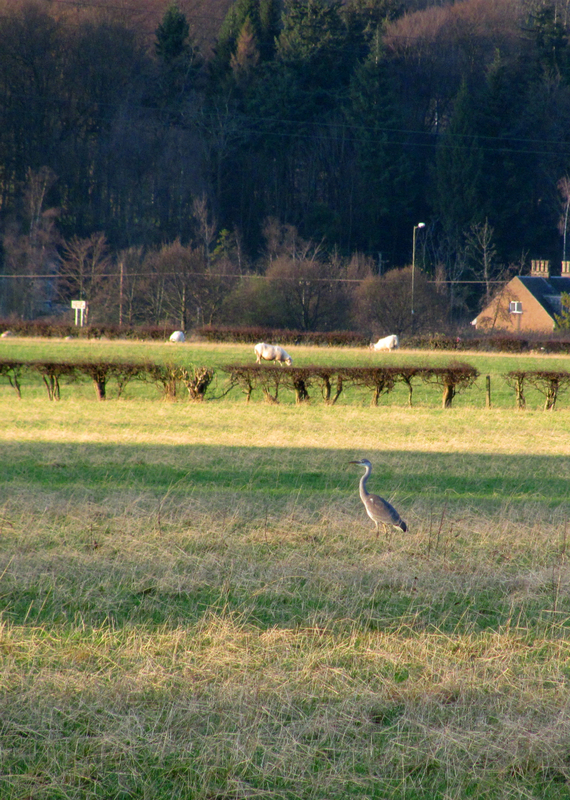 We startled each other, and the heron lifted itself away and flew heavily across the field. I crouched in a space among the shrubbery edging the pond and waited for half an hour, hoping to get a shot of the heron returning. As my pins and needles set in, I could see it waiting politely in the distance for me to leave. A honking sound in the sky drew my eye to a skein of geese flying West for the Winter. Common knowledge dictates that geese fly South for the Winter, but here they always fly West. Perhaps they are headed for Canada. Rapidly losing sensation in my legs, I stood and meandered back to the cottage, leaving the heron to its own devices. 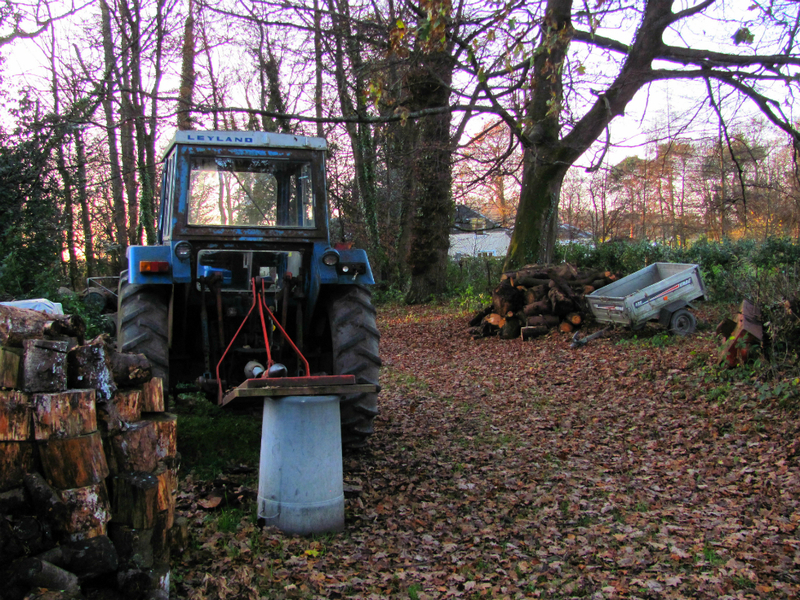 Under the trees near the pond, someone had been chopping firewood, and the air smelled sweet and damp. 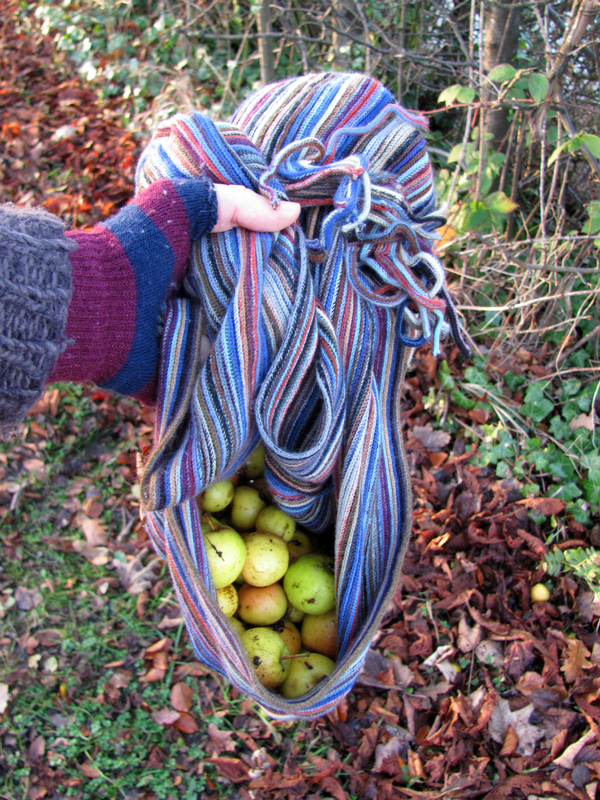 The crab-apple trees along the lane have unburdened themselves of their fruit, and I used my scarf as a makeshift bag to collect it for the guinea pigs. I now feel refreshed and cheerful, the guinea pigs are well fed, and my assignment calculations are looking as daunting as ever. The lady I buy eggs from told me, as she grabbed a boxful from her kitchen cupboard and handed them over, that she had two new tups in the field next to the pigs. When I reached the gate, I was confused by what I saw. Tups are rams, but these animals are twice the size of the other sheep around here, with distinctly goat-looking patterning. I spoke to them gently as I approached. The smaller one hung back, but the larger one sat placidly until I reached him, and leaned into my hand when I stroked his head and neck. I knelt in the grass beside him, enjoying his friendliness. I recalled something the Pig Man had said back in April. “Are you serious?” I had goggled. 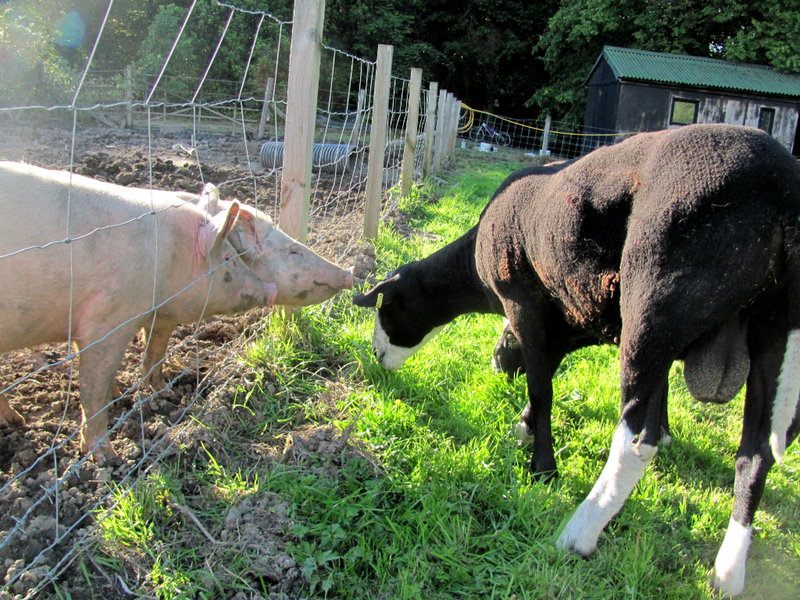 Whether these tups be goats or sheep, the pigs are fascinated by them, and followed them up and down the fence, grunting with enthusiasm. The sheepgoats seemed to make a point of grazing right up close to them. 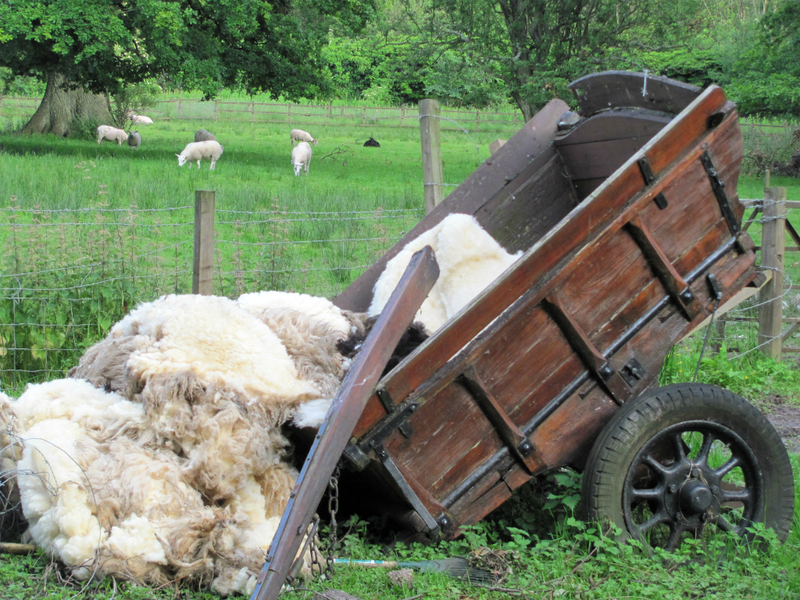 A clue to their identity lay beside the stable door: freshly-shorn fleece – two animals’ worth. But then, some goats have fleece. Angoras, for example. 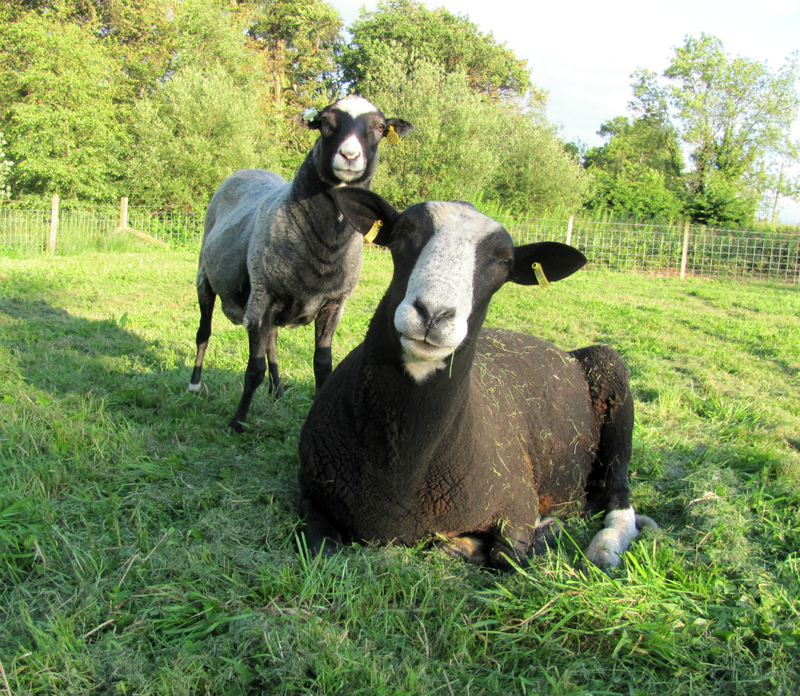 Suddenly, I clocked the lovely long dangly tails the tups were sporting. “The difference between a goat and a sheep,” our friend Shaunette had once informed me, “is that goats have tails that stick up, and sheep have tails that hang down”. A shadow passed the window, and I looked up to see a gypsy caravan moving slowly up the lane toward the manor. It was the horse-drawn kind, and I could hear cheerful voices coming from the front as it receded from view. “You could always say no thanks,” I pointed out. “Have you met me?” asked Bunty. And it is true that the gatehouse is awash with clothes pegs and trinkets and Watchtower magazines which Bunty has obediently accepted from every passing touter who has knocked on the gatehouse door. 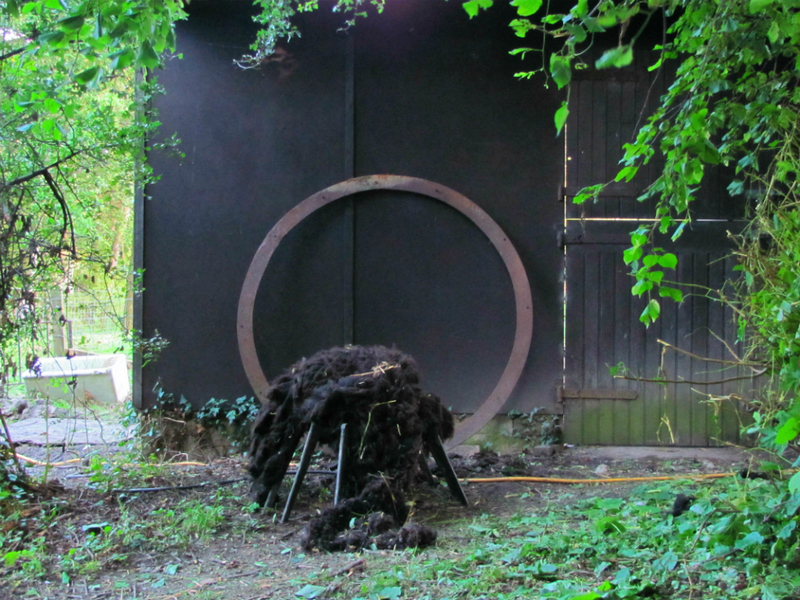 As it turned out, the gypsy caravan wasn’t occupied – yet. 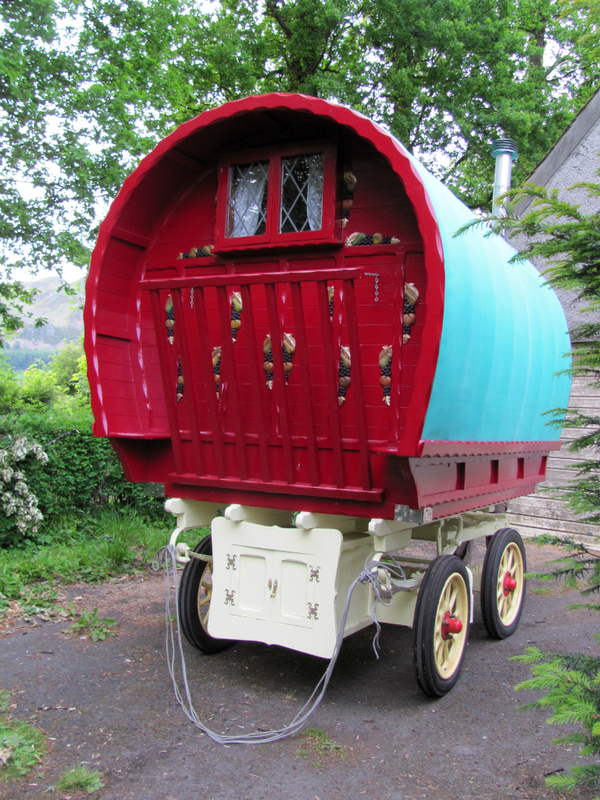 Our neighbours at the manor are setting up a Bed & Breakfast, in the form of three gypsy caravans in a meadow. The one I saw moving up the lane was being delivered. The caravans will overlook this field where the manor people keep their sheep. Had I arrived here earlier, I might have photographed the shearing process. These fleeces felt downy-soft, and warm from the unexpected sunshine. 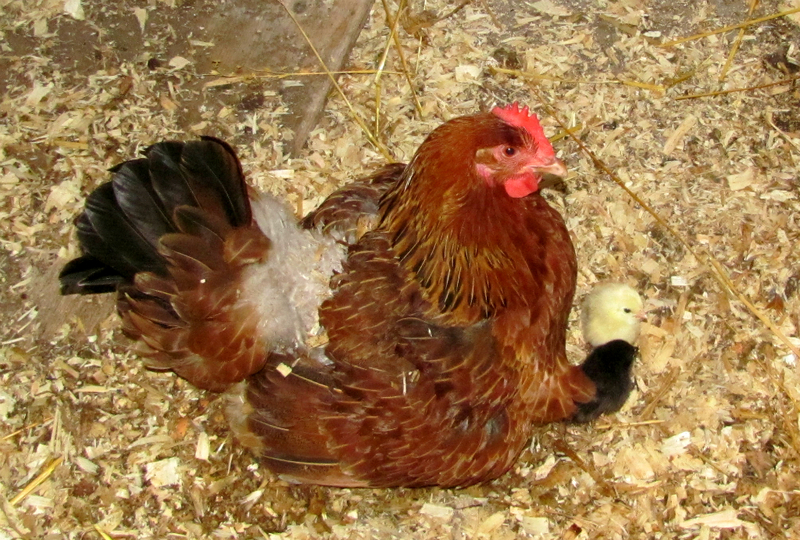 As I watched, two chicks sprouted, as if by magic, from the hen’s plumage. 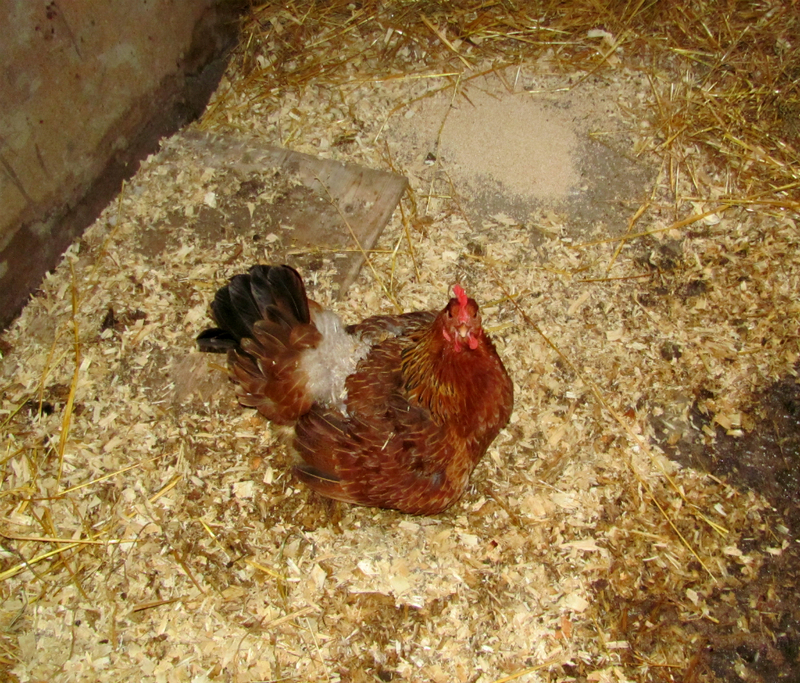 They eyed me and cheeped several times, before returning to their sanctuary beneath her wings. 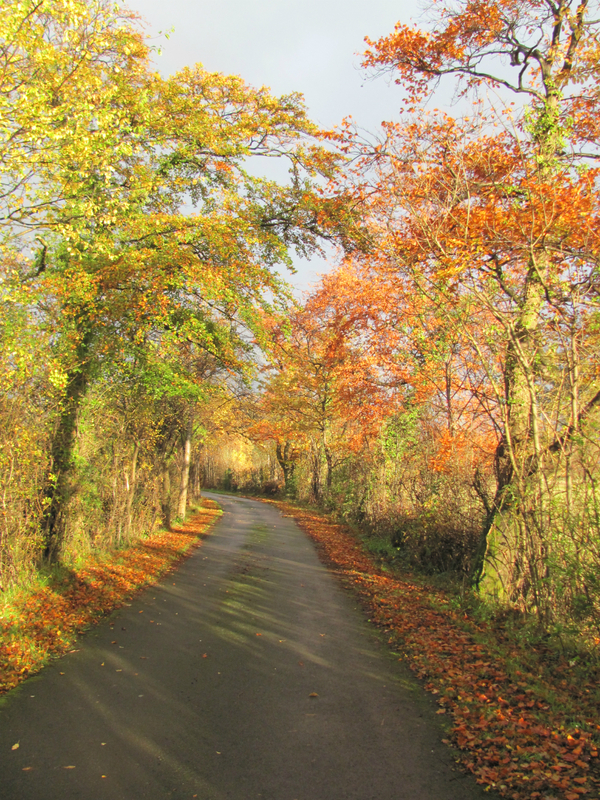 Cycling home with my cache of photographs, I pondered how little space such treasures take up – and yet they contain so many memories. I knew Bunty would be relieved that I had bought no more pegs. I had bought half a dozen eggs, though.